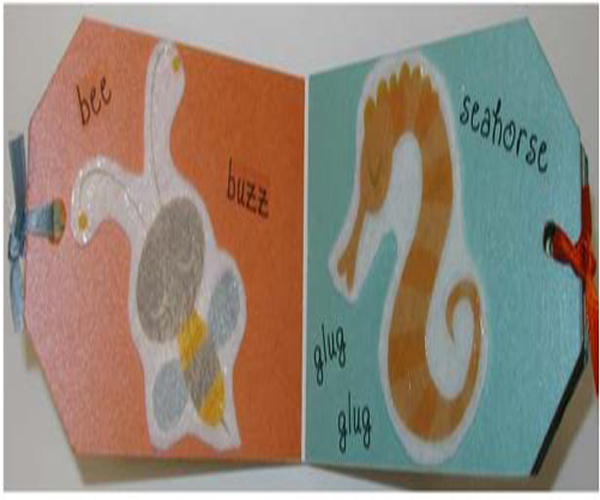 Project Description: Create custom animal books with Grafix Rub-Onz and Double Tack Mounting Film. Create text and animal characters on your computer. Here we have used clip art animals found on Microsoft.com. Print the text and animals on the Rub-Onz material and apply the adhesive sheet according to the instructions. Apply Double Tack to the back of the felt. Cut out the Rub-Onz animals and apply to the felt. Trim the felt around each animal. Cover the blank board book with the colored card stock, alternating colors on each page, adhere the card stock to each page with a thin layer of Tacky Glue. Punch a hole in the ends of the pages and tie a small piece of ribbon through the hole. Peel off the Double Tack liner and apply an animal to each page. Transfer your text Rub-Onz to the page around the corresponding animal.